Relish a little taste of Italy in Airlie Beach! Thoughtfully designed to mimic the stunning villages of traditional Tuscany, Toscana Village Resort gifts visitors with panoramic vistas over the imposing Coral Sea, spacious living and serene gardens beds to admire. Round up the troops and check the family into Toscana Village Resort for a luxury holiday in Queensland! Each room at Toscana Village Resort features a spacious and comfortable apartment-style layout for your ease. As well as being well-appointed, each apartment is fully self-contained with an expansive lounge room, dining area, equipped kitchen and laundry. Enjoy afternoons on your private terrace, escape the Tropical North Queensland heat with air-conditioning and bring the outside in with floor-to-ceiling glass windows and doors. Toscana Village Resort offers 1 Bedroom Apartments, 2 Bedroom Apartments and 3 Bedroom Apartments – accommodating all party sizes! Toscana Village Resort gifts guests with a wonderful rage of facilities to suit all travellers. Perhaps the most impressive offering is the number of sprawling pools available on the property! 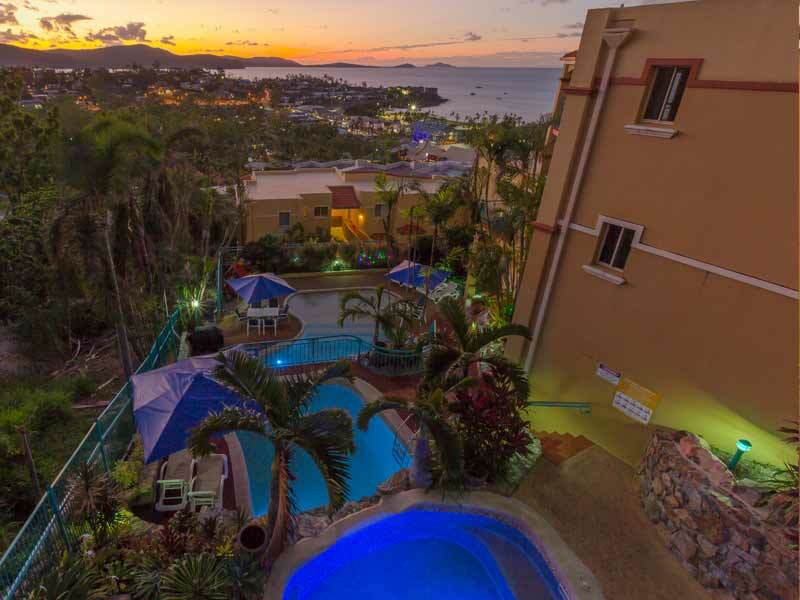 Each of the 4 pools are carefully located on cascading levels so you can escape the tourists of Airlie Beach and find your own spot to relax and unwind. When you’re ready to stay dry, why not make use of the barbeque on the lower pool deck or grab delicious seafood to go from Fish D’vine and wine from the awesome inhouse wine range? Have happy little ones with the kids’ playground on-site while the parents take a seat and enjoy some much-needed R&R in the pristine gardens plotted around the resort. Why go to Toscana Village Resort? 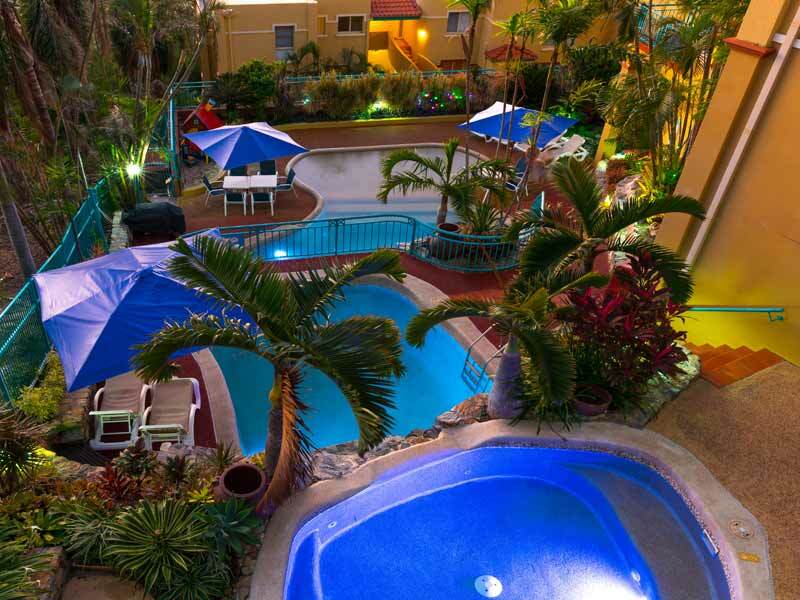 Toscana Village Resort is sure to deliver an epic tropical getaway for you and the family. 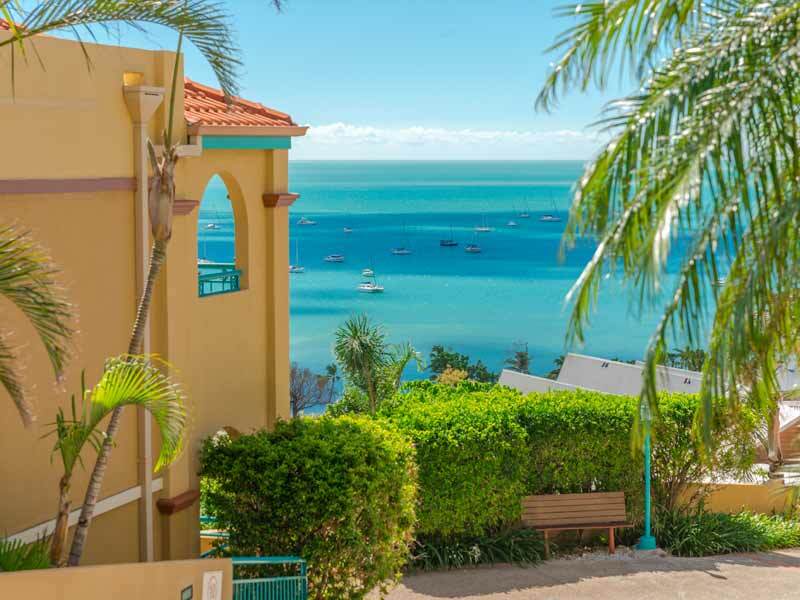 With supreme ocean views, expansive terraces, multiple pools, self-contained apartment living, kid-friendly facilities and a prime location in Airlie Beach, this property is unrivalled. 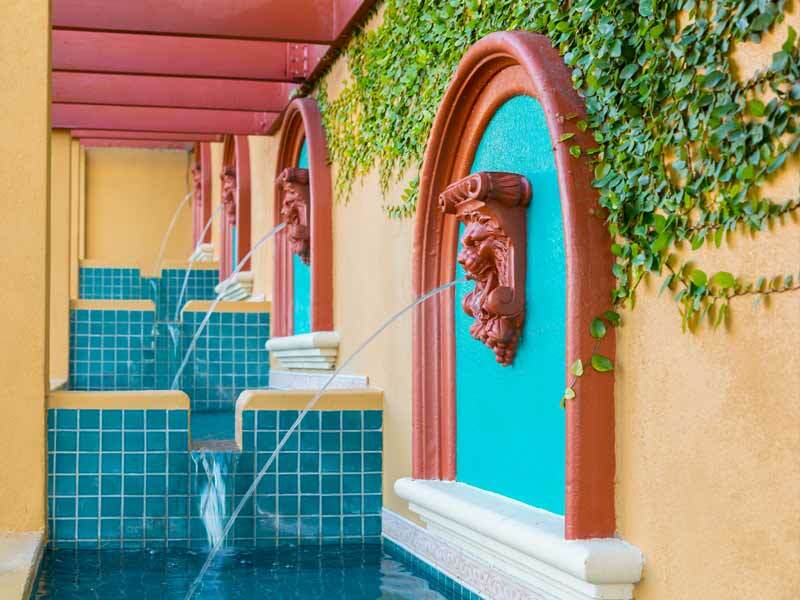 What’s more is the unique Tuscan influence entirely evident throughout the resort. Guests can enjoy an exotic cultural exchange in their own country at Toscana Village Resort! You’ll also have the chance to snorkel, dive or boat across the world-famous Great Barrier Reef while staying here… why wouldn’t you want to go to Toscana Village Resort!? 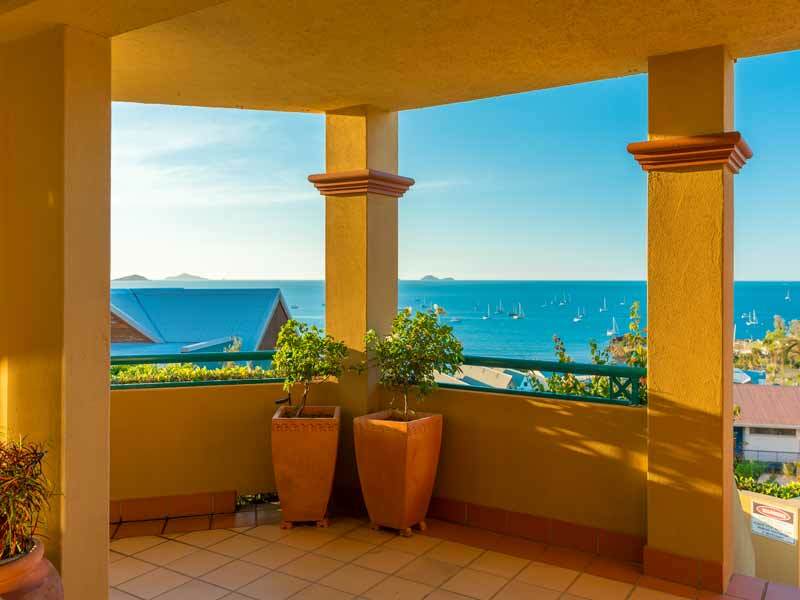 Book the 1 Bedroom Apartment at Toscana Village Resort for a memorable stay in Airlie Beach. These rooms are cautiously appointed so guests can delight in commanding views of the ocean and lush tropics surrounding the property. Welcome the revitalising sea breeze and sunlight inside with your floor-to-ceiling glass doors or escape the Queensland heat with air-conditioning. Spread out and feel comfortable with a wide lounge room, dining area, fully-equipped kitchen, laundry, en-suite bathroom and private balcony! This room is ideal for 2 guests. Book your Italian-style 2 Bedroom Apartment for the ultimate in spacious and relaxed living. Bask is evocative ocean views from your grand terrace, cool down indoors with air-conditioning, make use of your flat-screen TV, large lounge area, dining room, laundry, fully self-contained kitchen and 2 bathrooms! This is the ideal space from which to kick back and watch the inviting scenes of Airlie Beach unfold below. Impress family and friends with this spectacular 3 Bedroom Apartment at Toscana Village Resort. Influenced by beautiful Tuscany and full of light, this room features comfy Queen and Twin bedding as well as a convertible sofa in the enormous lounge room. Feel at home with a fully-equipped kitchen, separate laundry, large wardrobes, expansive dining area, 2 bathrooms, a deep soaking tub, flat-screen TV and many more amenities to enhance the comfort of your stay. Spend your days gazing out over captivating views of the village’s vibrancy and the Whitsundays’ awesome yacht scene. 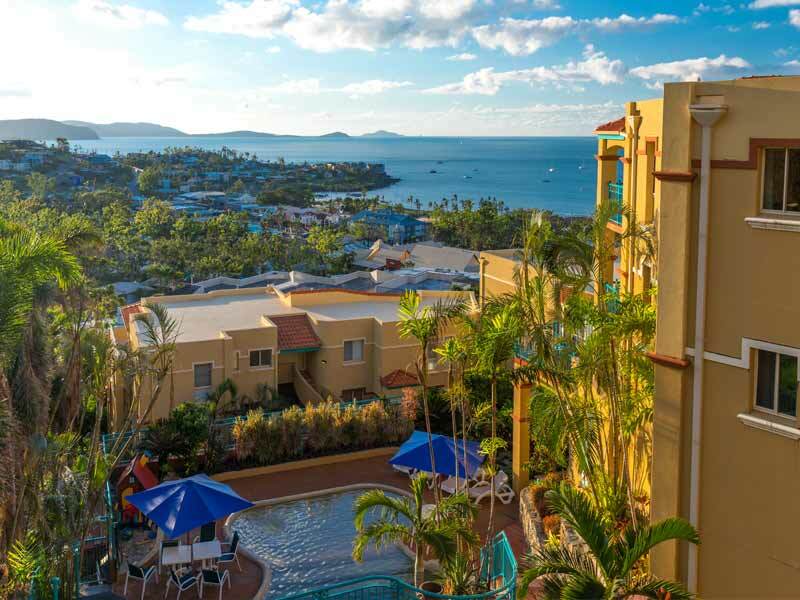 Toscana Village Resort boasts a premium location on the scenic coastal village of Airlie Beach, Tropical North Queensland. 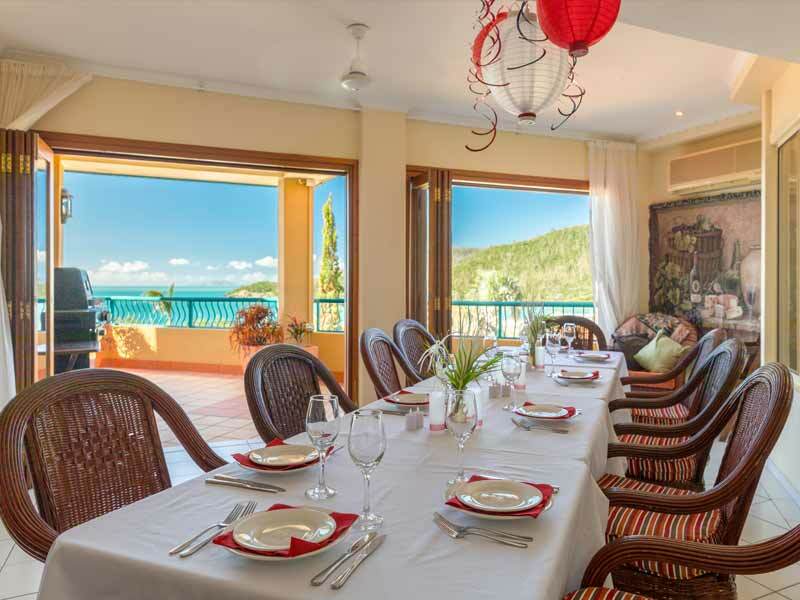 While the resort is set directly next to great bars, restaurants and shops, its hilltop position as well as its proximity to the Coral Sea, Great Barrier Reef and the 74 surrounding Whitsunday islands brings serenity to the atmosphere. 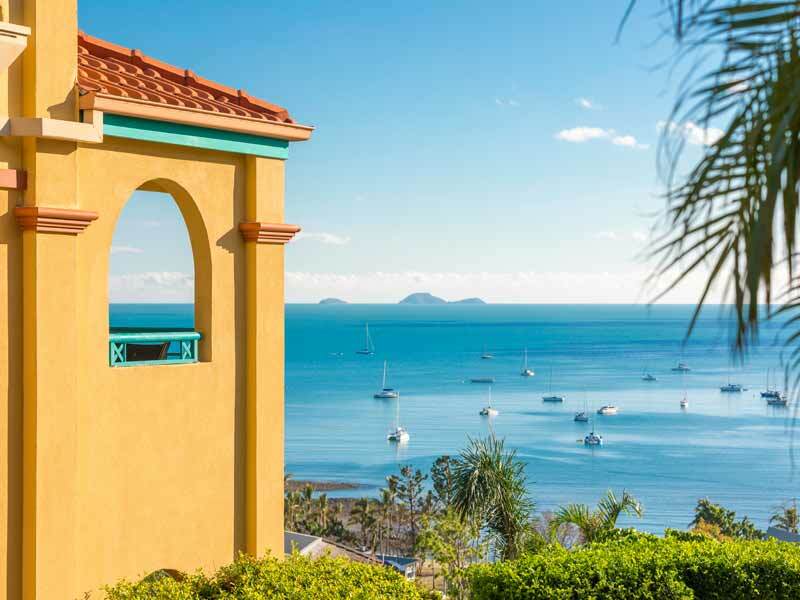 Travellers can access Toscana Village Resort by flying into Whitsunday Coast Airport, Proserpine (approximately 25-minutes by car from the resort) or Hamilton Island Airport (approximately 1-hour by ferry to the resort). With tropical climate year-round (a favourable average temperature of 27°C), Airlie Beach and neighbouring Whitsunday Islands provides guests with endless things to do while on holiday no matter what time of year you choose to visit. While the resort offers guests 4 sprawling pools, a great barbeque area and expansive terraces to take advantage of, there is much to see and do in the area. Explore the stunning region by cruise ship, raft, yacht, jetboat, helicopter or sky dive! However you choose to travel, you’ll have access to the striking coral banks of the world’s largest living reef, whale watching territory, exotic wildlife bays, waterfalls and more. Whether you want to totally relax or soak up the adventure, Toscana Village Resort is the ultimate holiday destination for you. The location was excellent and the staff were very helpful. Excellent value for money! The balcony overlooked Airlie Beach and the sunrises were spectacular. The unit was large and spacious. 5-stars!